Johnny is also deeply involved in working for the long-term productivity and protection of the Deadwood/Siuslaw watershed. Johnny's Newest Novel, "Looked Over Jordon" is now available from the author and at the Deadwood Trading Post. Since 2010, I have written and published four novels, all based on the settlement of the West, and the impacts of People on Place and those Places on their People. The first, “Dawn's Early Light” (pub. 2011) is a stand-alone novel recounting the lives, loves, hopes, successes and losses for six generations of the first pioneer family to settle in south-central Wyoming, in 1849, after dropping off the Oregon Trail. Here are real cowboys and cowgirls, Indians of the past and present, a militant suffragette, a faith-challenged evangelist, a newspaper owner, and many others linked together over time by the joys and burdens of a century-and-a-half of birthing, growing up, and growing old, along with the changes for better and for worse of this landscape and its inhabitants. 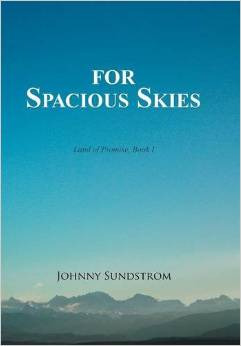 Book I: "For Spacious Skies" (pub. 2014) takes place over five years following the last battle of the War Between the States, as the young family it features travels the Oregon Trail seeking a homeland to settle into in 1869. Inspired by and borrowing elements of its story from the Biblical epic of Abraham, Sarah, and Hagar (don’t worry, it’s not religious), these three novels evoke the timelessness of love, hardship, faith, and triumph, and the restless urge to follow one's own destiny. This first volume follows their epic migration across America as they encounter and overcome nature’s challenges, violent human tensions, nearly impossible tests of endurance, and succeed in realizing their aspirations for beginning a new life among the ranchers, miners, and Indians of the still-untamed frontier. Book II: "Mine Eyes Have Seen" (pub. 2016) takes up where Vol. I leaves off, as the family builds its new home and increases in size. An unexpected discovery changes their relationship to the land and their Indian hosts. The togetherness, separations and reunions between the characters Abe, Sarah Beth, and Helga are all portrayed here, as well as the increasing difficulties of maintaining a single household on the frontier. Further north, outbreaks of violence between Indians and the white settlers threaten to break into open warfare, and this book culminates with the Flight of the Nez Perce (1877). Helga ends up wounded in one of the battles, while Abe has no idea where to look for her. 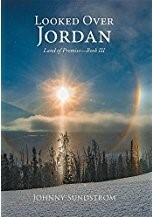 Book III: "Looked Over Jordan" (pub. 2017) continues the family’s multifaceted saga up to and into the first decade of the 20th Century, as the rapid and tumultuous transition of the American West is embodied in their turbulent lives, and the realities of aging. Abe is invited to edit a start-up newspaper, and a short career in State politics threatens the relationships he holds most dear. As he tries to use these opportunities to speak out for his native friends’ fight to regain their homeland, he experiences and comes to understand their defeats, and their time-tested resilience. In the sunset of their lives, as the next generation matures, these individuals are all caught up in new struggles to adapt to an unforeseeable future. These books can all be found on Amazon (credit card), or ordered directly from me, at lower cost, $24.00 per copy, $45.00 for two, and $20.00 each for three or more (includes shipping and handling). JOHNNY SUNDSTROM has lived most of his life in the American West, having crossed the continent overland and by air many times. He is part-owner and manager of a cooperative livestock and forestland operation in western Oregon. As Founder and Director of the Siuslaw Institute, he provides natural resources consulting and administers watershed restoration and education projects. His international activities have included work in Australia, Russia and Kenya. For more than 40 years he has spent part of every summer visiting his relations in Wyoming. He graduated from Williams College in 1966 with a degree in English Literature, writing extensively over the years. Since 2010, he has published the stand-alone novel Dawn’s Early Light, and the three-volume Land of Promise series.